Athletics’ governing body has promised to respect the Court of Arbitration for Sport’s (Cas) decision on rules over testosterone levels in female athletes. The IAAF has ruled some female runners with naturally high testosterone levels will have to race against men or change events, unless they take medication. But Olympic and world 800m champion Caster Semenya has said she will fight the decision, calling it “unlawful”. The IAAF and Athletics South Africa have agreed to honour any decision. “The meeting was cordial with both organisations agreeing that the Court of Arbitration for Sport was the right body to arbitrate this matter and its final decision will be respected by both organisations,” said an International Association of Athletics Federations statement. The rule, which comes into force on 1 November, applies to women who race in track events from 400m up to the mile. Cas says an arbitration procedure has been opened and a hearing will be held at a later date. 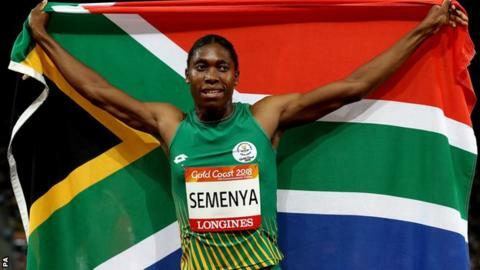 Semenya, a two-time Olympic champion and three-time world champion, has previously been asked to have gender testing by athletics chiefs, but no results have officially been made public. “It is not fair. I just want to run naturally, the way I was born,” said the 27-year-old South African. Lawyers Norton Rose Fulbright are leading Semenya’s legal challenge in Lausanne, Switzerland. Wednesday’s statement said IAAF president Lord Sebastian Coe had insisted “no individual athlete has been targeted in the creation of the regulations”. Coe added that the IAAF has a responsibility to be inclusive, while also ensuring fair and meaningful competition. He said: “To do this we need to create competition categories within our sport that ensures that success is determined by talent, dedication and hard work, rather than by other factors that are not considered fair or meaningful, such as the enormous physical advantages that an adult has over a child, or a male athlete has over a female athlete.